I liked the illustration of This is Ivy League in my previous post so much, that I looked up the artist. 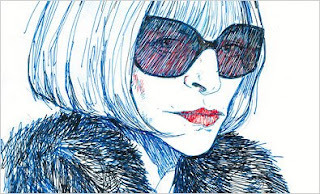 Hope Gangloff is an illustrator from New York, whose work has appeared in publications like New York Magazine (the above portrait of Anna Wintour was commissioned by the New York Times,) as well as her own artist shows at galleries. You can check out Gangloff's webpage for more illustrations and learn more about Gangloff in a very cool interview she did with Chief Magazine a few years ago. I think I like Gangloff's work so much because while her drawings capture human flaws and less graceful moments, there's also a real beauty to the normalcy they convey, too.